You have started a new business, one of the most rewarding activities of an entrepreneur. But with great rewards comes great risk, especially when it comes to having a sound financial plan as well as outlining the cost of everything. These have led many small and medium-sized businesses to make some common mistakes that can cripple their new startup. From handling inventory to sourcing for raw material, form chasing debtors to billing creditors, the day-to-day running of your business can hinder you from recognizing these 9 business mistakes and looking for a way to solve them. Here are the 9 common mistakes that occur and what you can do about them. Employees are the biggest expense of any business. They are also the biggest asset you can have in your venture so getting it right during the hiring phase can mean the success or failure of your business. With direct expense like payroll taxes, wages, insurance, compensation and indirect expenses like office space, equipment, you have to make sure that each person you engage will make a good financial impact to your bottom line. Don’t hire too many people at once, make it a gradual process. You should make sure that you get a great team of individuals driven by a passion for excellence to join you in the business. Use a reputable recruitment agency to help you get the best people. In order to ensure that you keep a check on your team’s productivity, it is advisable to use a software like actiTIME that can keep a track of things that your team undertakes and increase the productivity of your business. If you get the wrong set of people, you may become apprehensive and find it hard to delegate responsibilities, leading to mistake no 2 below. If you are in business, and you are the accountant, purchasing manager, customer service unit, cashier, and marketing manager, you are bound to crash soon. Physically, emotionally and financially, it is not healthy for your business. If you are among those that will not allow their employees to use their initiative and think for themselves, you are heading for failure. According to the Park Scholarship Leadership skills training, delegation improves efficiency and development of your business. You should learn to delegate certain duties in your new business venture to grow. Once you are sure you got great people on your team, let them use their initiative to do the right thing. Apart from that, you can use these free small business software available in the market that automates your work & reduces your workload. This is another mistake that businesses make that can hinder your success. When you do not have a proper accounting system to handle your finance, that is a disaster waiting to happen. According to iEduNote accounting is critical in your business because it gives you accurate information about your assets, debts, liabilities, and profit using facts and figures from data, reports, analysis and records. Since this is an important area of your business, you need an expert to give you the correct financial position of your business at all times. You should get an expert who knows how to use the latest accounting software to do a proper check and balance in your business. When you have no future plans for your business, you won’t know how to allocate your resources. If you don’t properly assign the resources, how will you then budget adequately? So have a well-written business plan properly outlining the cash flows in and outflows and also the plans for future growth. While you can’t adequately predict the future, you can use creative and strategic planning to create a successful future for your business. This is where a solid business plan comes into play. Make sure that the numbers based on real facts, and solid projections and not on mere guesswork. Plan for the long term, build your business up, create efficient solutions to problems to make sure that your business will be here for a long time. If you are not following up with your prospective customers you are leaving a lot of money on the table. If you are not using email in your marketing you are missing on a strategy that converts 6x more than social media. How do you follow up with them? The simple answer is through effective and strategic email marketing. With email, you keep in touch with people who have shown interest in your products or services but couldn’t make a decision immediately. You interact with them and send them valuable information so that when they are ready to buy, you will be the first person on their mind. Email marketing is economical, effective, personal, customisable and measurable and so helps you get business success. You can start with the Sales Handy integration to set up your email marketing campaigns. With SalesHandy you get services like document tracking, email tracking, mail merge, plus they offer you data-driven results by giving you information on file opening, engagement, time spent and email notifications. Are you so concerned about your business that you do not have time to know your current cash position? 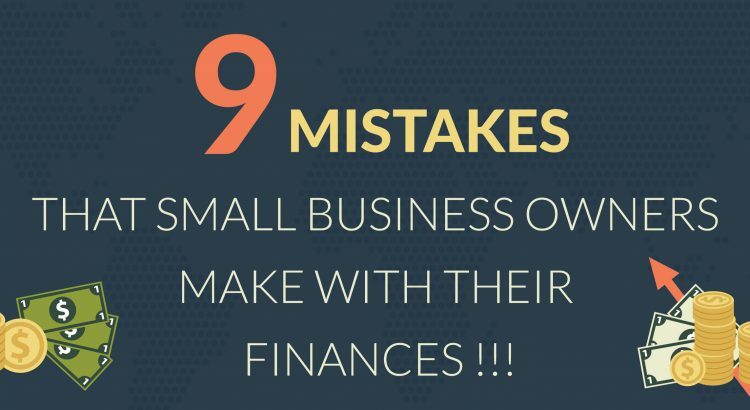 This is another common mistake small business owners make which could spell doom for their business finances. They wait till the bank notifies them of an overdrawn check before they take care of their cash flows. Not having a proper cash flow system can mean the difference between a bad and a good fiscal year. You should know how much it takes to keep your business operations running smoothly every month. Getting a good accountant or financial advisor to help you in this area is advisable. You should have a simple financial management system in place to track your expenditure and revenue. This will help you avoid getting into unnecessary debt in your business. A report from the Open Libraries says that a mission/vision statement is very important to an organisation because it properly communicates your strategy for development, the purpose of your business and the measurable goals and objectives you will use to measure the success of your startup. A good mission and vision statement should tell people who you are, what you do, your principles and values and where you see yourself in the future. You need to get a well-written, properly communicated, clearly understood and jointly shared a mission and vision statements for your business. It will help you to perform better and ensure that you will get the success you desire. These questions help you to make a good forecast, helps you in identifying budget gaps and also showing you the areas that need your attention. If you start making preparations for the next year using the profits you have made this year, at least don’t start spending because of the money you are expecting. This is clearly counting your chickens before they hatch. You can make sales forecast using the profits you made this year as a base but remember that market conditions change and so the projections might turn out wrong. You have to wait until you have delivered the service before you can count the money as revenue. A good way to avoid this mistake is to discuss payment terms and costs in advance. Find the right way of forecasting that is unique to you and your business and use it to make a create a strong strategy for your business success. At one time or another, you may need to invest in a new server, a big computer or a big piece of machinery for your business. You need to have an appraisal to consider if the new large purchase is necessary for your business. Consider the time of the year you are making the purchase and also how buying this will affect your cash flow and revenue. Again, when getting this new item you should consider the payment terms. Paying cash for such is good but it may adversely affect the finances you need to run the business. That is why you need to be flexible in making payment. Section 179 allows businesses like yours to reduce the expenses on some purchases like furniture, computers, certain software and more. So check with your tax advisor to see if you will get a tax break with your new purchase. When getting a loan, look out for high-interest rates, especially if you are paying with credit card. If you are getting a loan, its best to go for a short-term loan. A lease works better than a loan if the item is one you are using on a temporary basis or an item that requires constant updates. This way, you will have money to run your business and still be able to buy the machinery you need for your business. Getting a hold on the financial segment of your business is a big challenge but it is necessary for the survival and profitability of your business. When you avoid the above mistakes and put the measures outlined in place, you’ll be able to face any challenge the market may throw at you. You’ll also be able to pay your suppliers, get the needed machinery, get more customers and make more sales. Juliet Emem is a freelance B2B writer that focuses on business, tech and health. You can hire her at her website - http://julietemem.com/hire-me.